The familiar traditions associated with the celebration of ‘Christmas’ or the ‘Festival of the Nativity of Jesus Christ’ throughout northern Europe are far from Christian in their origin, and many of them are a direct continuation of the festivities of the Saturnalia of ancient Roman culture, which are in turn related to the equivalent ‘Kronia’ of ancient Greek culture. Both of these were introduced to Europe’s barbarian north with the diffusion of these cultures – a process beginning in the latter half of the 1st millennium BCE and culminating with the Roman conquests. Even well into the Christian era, ancient aspects of the seasonal celebration derived from the pagan era continued to be introduced between nations – the ‘Christmas tree’ (an ancient symbol of family) being an example. The essence of the Kronia and Saturnalia was a celebration of a supposed ‘golden age’ of humanity, ruled over by the titan god Kronos, who was known to the Romans as Saturn (probably meaning ‘Fertiliser’, after the Greek word Sathe). In this age, humans were said to have been virtuous and egalitarian – a state which degenerated once Kronos/Saturn was overthrown by Zeus/Jupiter who established the ‘pantheon’ of twelve Olympians to rule over the heavens and the earth. The Attic Greek Kronia was celebrated at ancient Athens around midsummer and was a festivity shared between freemen, slaves, servants and masters in honour of Kronos and the ideals of the Golden Age, and usually involved a ceremonial aspect of (albeit limited) social role-reversal at which the masters sometimes served their servants at a feast, and servants or employees sometimes took on the identity of masters for the celebration. In ancient Rome, Saturnalia was held at midwinter – from the 17th December – and after a similar fashion. With time the festivity was extended to a week or more. It was a time of freedom from work, giving of gifts, the playing of games (dice, knucklebones, board-games etc), giving to the poor and feasting and high-living – a very public celebration enjoyed across all social strata, bringing them (for a short period at least) closer together. It seems, therefore, very similar to modern festivities such as Christmas and Hannukah where similar customs still prevail. 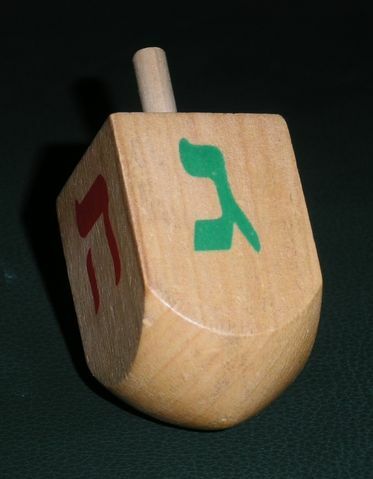 Anyone who has sat down to a family midwinter banquet wearing a Christmas paper crown and maybe spun a Hannukah dreidel or two is continuing a European tradition over 2000 years old! The Hannukah ‘Dreidel ‘is an ancient European custom. Image: Wikimedia Commons (Roland Scheicher). Saturnalia (and Kronia) was typically a festival of reversals, the custom of masters serving their servants or slaves being a typical example of this which persisted down to the modern era. Those familiar with my discussions of the ancient ‘Otherworld’ philosophy of Atlantic European cultures (particularly the ‘Celts’) will immediately recognise this as a related theme: the Otherworld was an inversion of our own peopled by the spirits of the departed looking for reincarnation once more in our realm. Where we had plenty they had little and hungered for what we possessed. By treating these spirits with respect and gifts, we might deter their hunger for our material gains. Saturnalia was a method for ceremonially redressing the imbalance implicit in human nature and satiating the needy forces which might, through jealousy (the old ‘evil eye’ concept,) detract from well-being. “…Meanwhile the head of the slave household, whose responsibility it was to offer sacrifice to the Penates, to manage the provisions and to direct the activities of the domestic servants, came to tell his master that the household had feasted according to the annual ritual custom. For at this festival, in houses that keep to proper religious usage, they first of all honor the slaves with a dinner prepared as if for the master; and only afterwards is the table set again for the head of the household. So, then, the chief slave came in to announce the time of dinner and to summon the masters to the table…” Macrobius, Saturnalia 1.24.22–23 (4thC CE) – trans. by Robert Kaster, Loeb Classical Library. In ancient Rome, the celebration coincided with the Larentalia – typically observed on December 23rd – a celebration of the Lares or familial ancestral/domestic spirits, and the elder Roman goddess Acca Larentia – the Mater Larum and supposed mother of legendary twins Romulus (Mars-Quirinus) and Remus. These were characters underpinning Rome’s famous founding myths and therefore the whole ‘dark season’ was a memorial of a distant idea of humanity’s foundation and founding sparks in the dark and distant past. The mythology of Saturn is intrinsically linked to that of the far bounds of time and space where he was supposed by the ancients to have been confined in the legendary overthrow of the Titans by the Olympians. His is the dark and misty realm at the bounds of what we now call space-time, usually depicted by the European ancients as at the furthest reaches of the encircling world-river Okeanos which bordered the heavens and Elysium, and stood above Tartarus – a perilous place full of ancient monstrous beings of legend that only the bravest mythical heroes might travel to in their sacred quests. These monsters were always portrayed as children of the offspring of Kronos/Saturn – the ‘Kronides’. The dark season was a time when the departed might be closer and should be paid respect. This darkness was – as I have discussed elsewhere in this blog – a source of refertilisation to the world, and the source for returning life to the ancient Europeans who believed expressly in reincarnation, like their cultural ancestors in Asia. The return of an ancient deposed god to engender equality and celebration among humans is an irrevocable part of these seasonal celebrations which appear to defy time itself, and the continuous shifts in human culture and religion in Europe. In itself it suggests a temporary dissatisfaction with the status quo: ‘Christmas’ remains a resolutely pagan affair.